Were you one of the few Mayo fans in Scotstown in 1995? 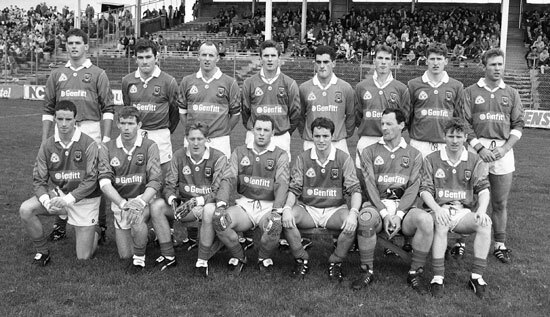 Were you in Scotstown in ’95? FORTY-NINE minutes into John Maughan’s second game as Mayo manager, there came a rarity in inter-county football – an abandonment. According to The Mayo News report of the National Football League match between Monaghan and Mayo, played in Scotstown in October 1995, referee Adrian Walsh ‘walked unsteadily towards the sideline, and then collapsed on the field, surrounded by medical officials from both teams, before being stretchered away’. Five minutes earlier, the Dublin official was given assistance on the sideline for what was thought to be an asthma attack. But he resumed, and looked to have fully recovered until he got ill again. Mayo weren’t too upset about the premature end to the fixture, as John Maughan recalled in conversation last week. “We had started quite brightly in that game, but Monaghan had stolen a march on us, and they had more or less turned the game in their favour,” he told The Mayo News. “We weren’t playing well enough to go on and win it, and I was quite content and happy that there wasn’t a replacement referee available … much to the frustration and annoyance of the Monaghan sideline. The Mayo News report notes that discussions between the managers of both sides on calling in one of the two linesmen to complete the game brought no agreement, for it appeared that Mayo’s Martin Murphy was the only one of the two who was an official referee. There was, Maughan adds, ‘no substitute referee appointed in those days’, and ‘each participating county provided a linesman’. Mayo led 0-7 to 0-4 at half time, thanks to points from Maurice Sheridan (two), sub Ciaran McDonald (two), Colm McManamon, James Horan and John Casey. Our reporter Seán Rice praised the midfield efforts of McManamon and Ardil Jennings, and said Pat Holmes did ‘quite well’ at full-back in the absence of Kevin Cahill. But Ronan Golding’s point was Mayo’s only score of the third quarter, and as Maughan noted, the momentum had swung in Monaghan’s favour. The score was 0-8 apiece when the game ended. Fast forward 11 months, and in the era before season tickets and the Cáirde Mhaigheo scheme, those laying moral rights to seats for Mayo’s first All-Ireland final appearance in seven years claimed to be at that abandoned game. ‘Scotstown’ became a byword for loyalty, so much so that – rather like the GPO in 1916 – many more claimed to have been there than could possibly have been accommodated. It was also the venue for the re-fixture, in January 1996, a game which Mayo won by 0-7 to 0-6. Trailing by a point in injury time, down to 14 men, the visitors looked to be heading for what would have been the first defeat of Maughan’s reign. Kenneth Mortimer had been harshly sent off (by Adrian Walsh, the same referee who had collapsed three months earlier) and, as Seán Rice put it – “a titanic struggle was ending in failure … we were sure”. But Anthony Finnerty landed an equaliser, and then Pat Holmes set up David Nestor for the winner. It was their closest call of a Division 3 league campaign that brought them all the way to Croke Park, and a semi-final defeat to Derry. Maughan doesn’t underestimate the importance of that result. J Madden; G Ruane, P Holmes, D Flanagan; A McGarry, J Nallen, D Shaw; C McManamon (0-1), A Jennings; S Murphy, J Horan (0-1), M Sheridan (0-2); D Nestor, J Casey (0-1), R Golding (0-1). Sub used: C McDonald (0-2) for S Murphy. J Madden; K Mortimer, K Cahill, D Flanagan; P Holmes, J Nallen, N Connelly; C McManamon, L McHale; M Gardiner (0-1), J Horan, M Sheridan (0-2); D Nestor (0-3), J Casey, T Reilly. Subs used: PJ Loftus for Reilly; A Finnerty (0-1) for Gardiner; D Brady for McManamon.